This article is about the mineral. For other uses, see Onyx (disambiguation). "Black Onyx" redirects here. For the 1984 video game, see The Black Onyx. Onyx comes through Latin (of the same spelling), from the Greek ὄνυξ, meaning "claw" or "fingernail". 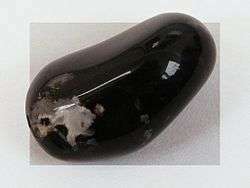 With its fleshtone color, onyx can be said to resemble a fingernail. The English word "nail" is cognate with the Greek word. Artificial onyx types have also been produced from common chalcedony and plain agates. The first-century naturalist Pliny the Elder described these techniques being used in Roman times. Treatments for producing black and other colors include soaking or boiling chalcedony in sugar solutions, then treating with sulfuric or hydrochloric acid to carbonize sugars which had been absorbed into the top layers of the stone. These techniques are still used, as well as other dyeing treatments, and most so-called "black onyx" sold is artificially treated. In addition to dye treatments, heating and treatment with nitric acid have been used to lighten or eliminate undesirable colors. It has a long history of use for hardstone carving and jewelry, where it is usually cut as a cabochon or into beads. It has also been used for intaglio and hardstone cameo engraved gems, where the bands make the image contrast with the ground. Some onyx is natural but much of the material in commerce is produced by the staining of agate. Brazilian green onyx was often used as plinths for art deco sculptures created in the 1920s and 1930s. The German sculptor Ferdinand Preiss used Brazilian green onyx for the base on the majority of his chryselephantine sculptures. Green onyx was also used for trays and pin dishes – produced mainly in Austria – often with small bronze animals or figures attached. 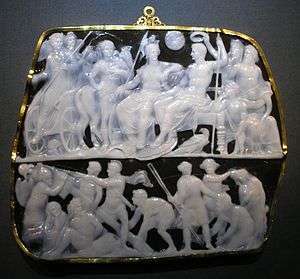 The ancient Romans entered battle carrying amulets of sardonyx engraved with Mars, the god of war. This was believed to bestow courage in battle. In Renaissance Europe, wearing sardonyx was believed to bestow eloquence. A traditional Persian belief is that it helped with epilepsy. 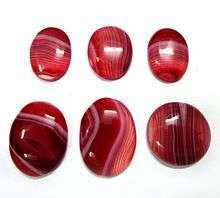 Sardonyx was traditionally used by English midwives to ease childbirth by laying it between the breasts of the mother. 1 2 "Onyx". mindat.org. Retrieved 22 August 2015. ↑ "Onyx". gemdat.org. Retrieved 22 August 2015. ↑ Lavinsky, Rob. "Onyx". mindat.org. Retrieved June 10, 2014. ↑ "Online Etymology Dictionary". etymonline.com. Retrieved 22 August 2015. ↑ Assaad, Fakhry A.; LaMoreaux, Philip E. Sr. (2004). Hughes, Travis H., ed. Field Methods for Geologists and Hydrogeologists. Berlin, Heidelberg, New York: Springer-Verlag. p. 8. ISBN 3-540-40882-7. ↑ Sinkankas, John (1959). Gemstones of North America. 1. Princeton, New Jersey: Van Nostrand. p. 316. 1 2 3 "The Manufacture of Gem Stones". Scientific American. New York, New York: Munn & Company: 49. 25 July 1874. ↑ "Onyx". mindat.org. Retrieved 22 August 2015. ↑ Hurlbut, Cornelius S.; Sharp, W. Edwin (1998). Dana's Minerals and How to Study Them (4th ed.). New York, New York: Wiley. p. 200. ISBN 0-471-15677-9. 1 2 O'Donoghue, Michael (1997). Synthetic, Imitation, and Treated Gemstones. Boston: Butterworth-Heinemann. pp. 125–127. ISBN 0-7506-3173-2. ↑ Read, Peter G. (1999). Gemmology. Oxford: Butterworth-Heinemann. p. 160. ISBN 0-7506-4411-7. ↑ Liddicoat, Richard Thomas (1987). Handbook of Gem Identification (12th ed.). Santa Monica, California: Gemological Institute of America. pp. 158–160. ISBN 0-87311-012-9. ↑ Kraus, Edward Henry; Slawson, Chester Baker (1947). Gems and Gem Materials. New York, New York: McGraw-Hill. p. 227. ↑ Liddicoat, Richard Thomas; Copeland, Lawrence L. (1974). The Jewelers' Manual. Los Angeles, California: Gemological Institute of America. p. 87. ↑ Porter, Mary Winearls (1907). What Rome was Built with: A Description of the Stones Employed. Rome: H. Frowde. p. 108. ↑ "Ferdinand Preiss". Hickmet.com. Retrieved 18 June 2015. ↑ "Lot 419, Schmidt-Hofer, Otto, 1873-1925 (Germany)". ArtValue.com. ↑ "BibleGateway". biblegateway.com. Retrieved 22 August 2015. ↑ Administrator. "Onyx". gemstone.org. Retrieved 22 August 2015. 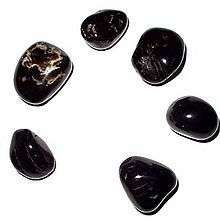 Look up onyx in Wiktionary, the free dictionary. Wikimedia Commons has media related to Onyx.